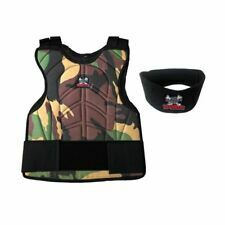 We are experts in paintball and are here to help you get the right products. However we are not able to service warranties. I've used this vest for paintball, and it does what it's supposed to do. It is also pretty easy to clean off, and it fits to the body fairly well. I saw a opinion that the material on this is thin and cheap. I just tried it on and although haven’t tested it out on the field, the material is not thin and more padded than expected which is good. Love the new smell it has as well as the Velcro straps to adjust to your body shape. The part for your neck is adjustable to and is held on by Velcro to ensure it is not going to protect your skin. The holsters for your pods are handy too. Love the vest. It comes with neck protected. That's a plus. Price is great.plan to bye another one . used it and loved it.